Submitting your site to a range of blog and RSS subscription directories can be a great way to increase visibility, but there are some mistakes to avoid. Jeff Behrendt at Search Engine Journal has written a very useful post that lists some of the common mistakes blogs make when submitting links to directories. Listing with too many directories. Being selective and choosing a number of quality directories will be more beneficial to your blog than listing with as many as you can. Worrying too much about costs. Jeff argues that it is worthwhile paying for submission to directories that will provide authoritative links, such as the Yahoo! directory, which costs around $299 (£145) per year. Using the same anchor text/description for every submission. All your directory entries should have their own unique wording or, failing this, you should have a few different versions of anchor text and description when submitting. Not writing an appealing description. It is well worth making the effort to write a description that will attract visitors to your site. 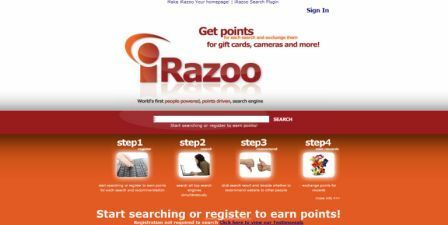 A group of US entrepreneurs has launched iRazoo this week, a search engine which uses recommendations from searchers to improve results and rewards them with points. Michael Mattis has offered e-commerce companies some tips for optimising landing pages on Yahoo!’s Search Marketing Blog. Wikia, the company led by Wikipedia founder Jimmy Wales, has acquired Grub, a distributed crawling service that will be used to build an index for its Search Wikia project. Grub, previously owned by LookSmart, has been released under an open source licence for the first time in four years. It uses volunteers’ idle computing resources to contribute to the project.